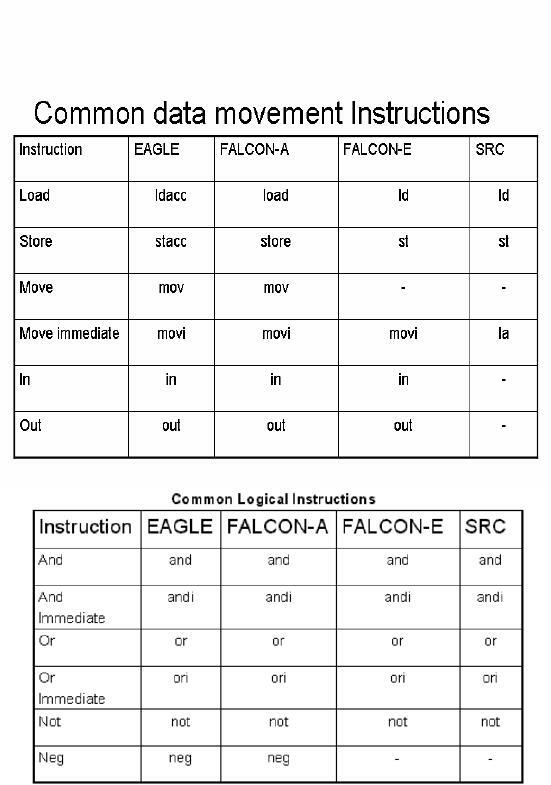 The programmer's view of the FALCON-E is shown in the given figure. We take a brief look at the notation that we will employ for the FACLON-E.
name in square brackets. 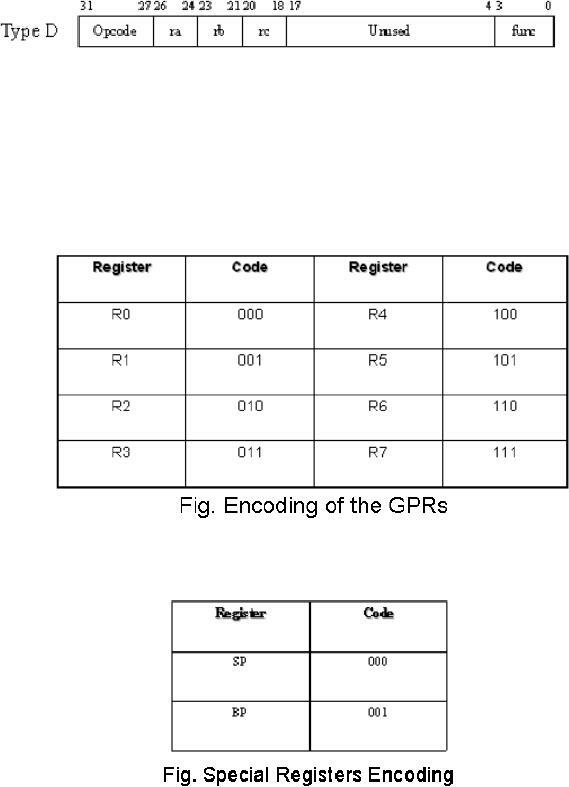 So R means contents of register R3. 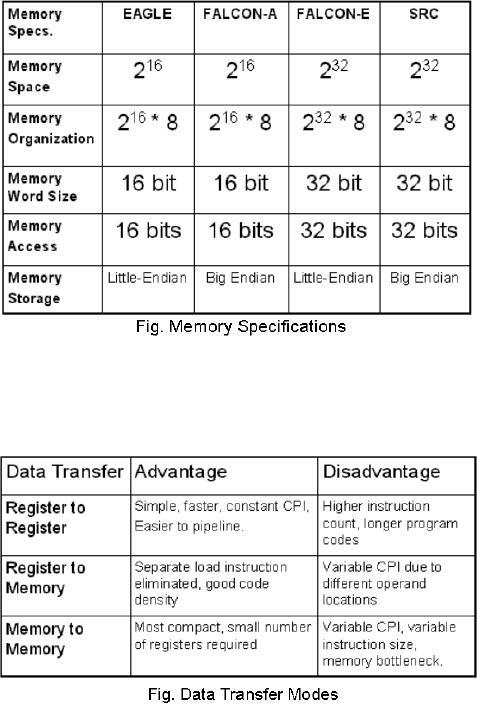 memory in the little endian format. The shown figure will make this easier to understand. 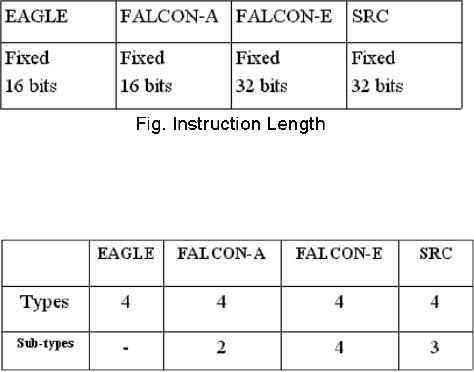 · Fixed instruction size, which is 32 bits. So the instruction size is 1 word. and the rest of the bits are either not used or specify a displacement. 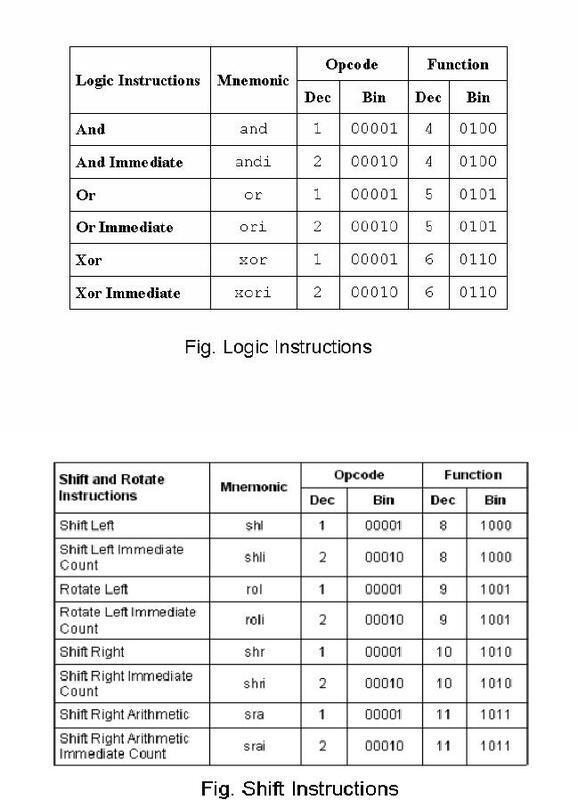 instructions that may have the same op-code, but different operations. unused, and a 3-bit function field. 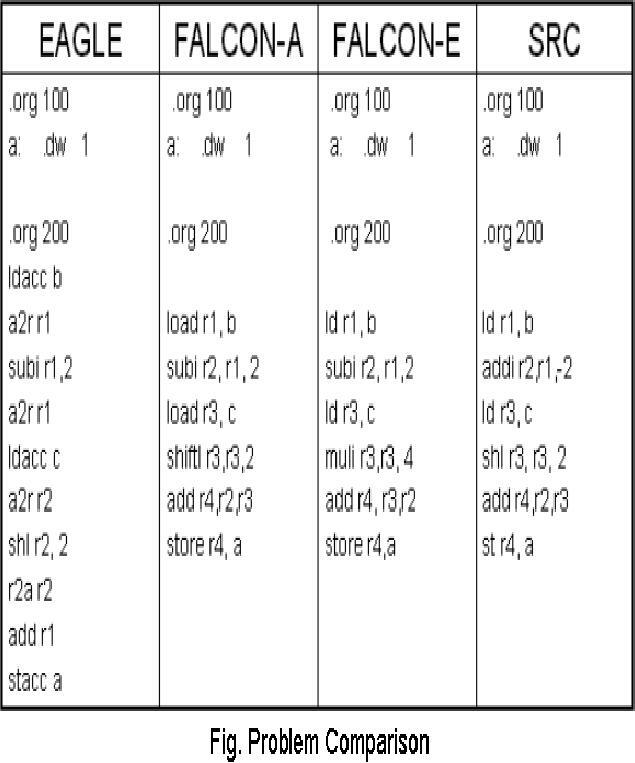 following table shows the binary encoding of the general-purpose registers. pipelining. We will study more on pipelining later in the course. the specified address returns control. by the immediate field value to take the jump. will load the contents of the memory at the address 1254h into the register R7. the contents of register R7 are saved to the memory location 1254h. 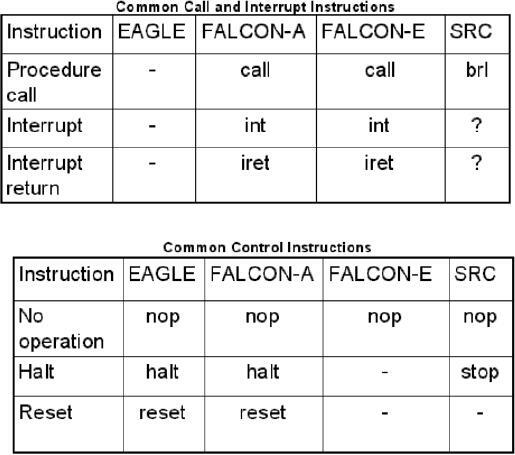 type C instruction format of the FALCON-E.
would become a subtract operation. Note that the symbol `~' is used to represent logical OR. tables at the end of this section. architecture), and cycle time (the total cycle time to execute a given piece of code). 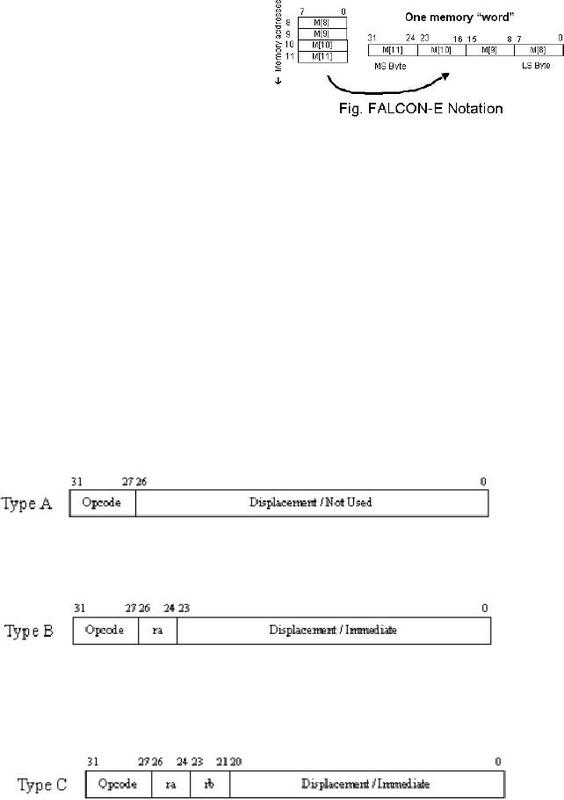 Classification of different architectures is based on the following parameters. 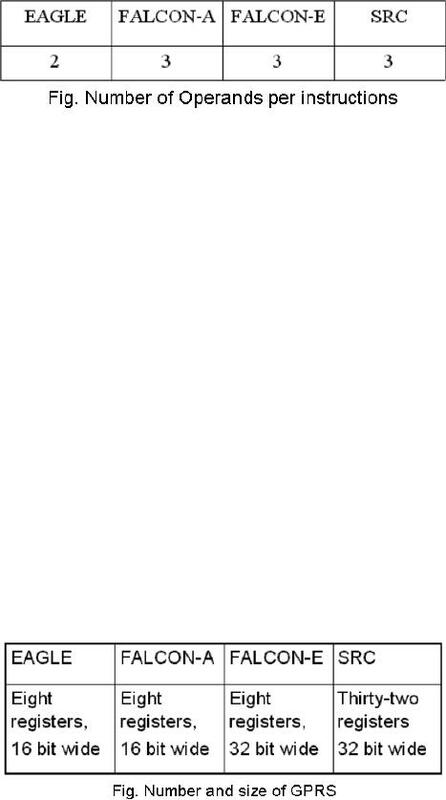 instruction length or the range (in case of variable instruction lengths). 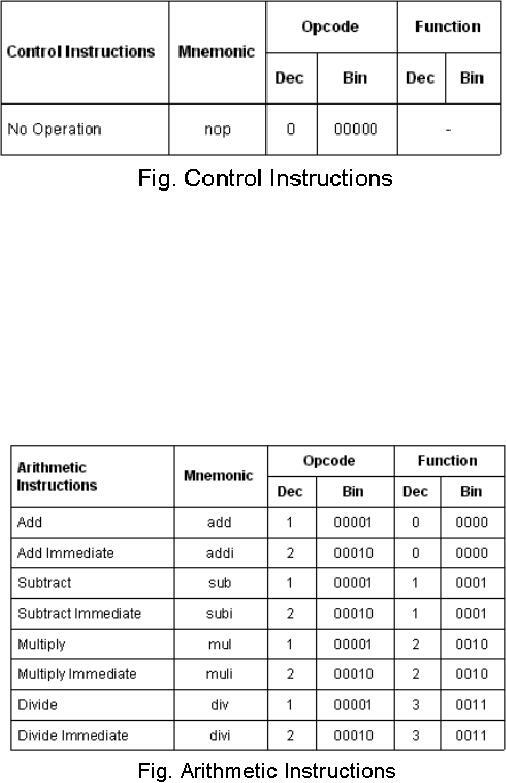 (which implies how many instructions can be encoded in a given number of bits). 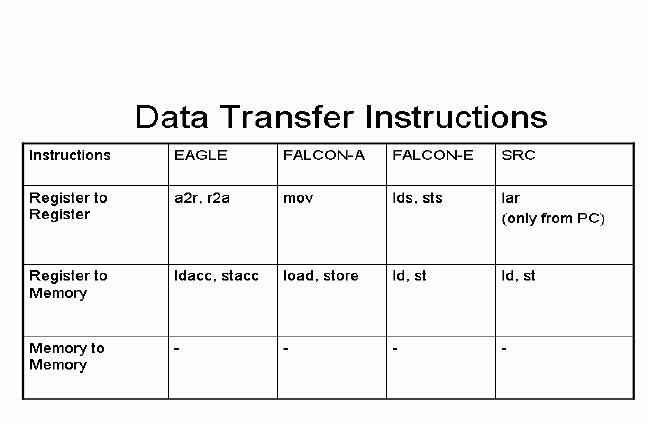 A summary of the instruction lengths of our processors is given in the table below. sub-types in detail in the related sections. E and the SRC processors may have 3, 2, 1 or no operands, depending on the instruction. accumulator being specified as a destination operand in the instruction. registers present in the register file, and the size of the registers. the processors under study, is in the given table. register. Accumulator is a special-purpose register. 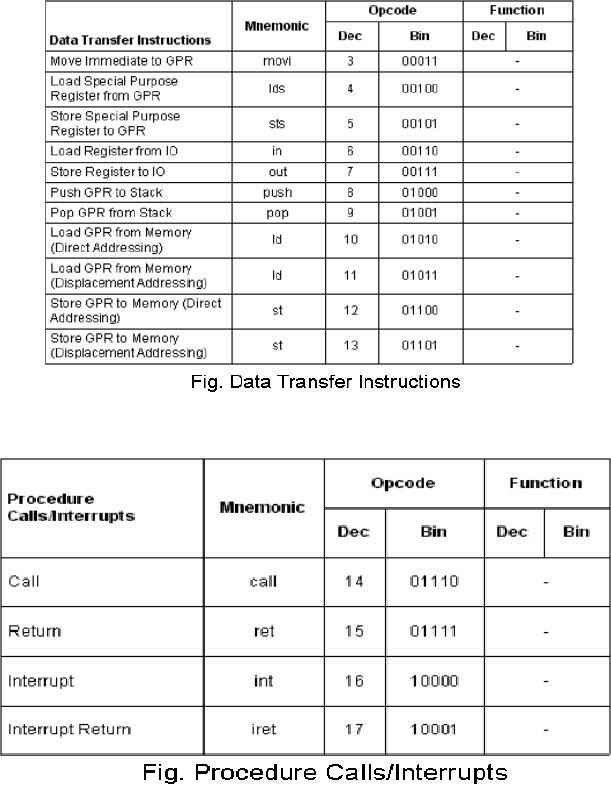 a register from/to memory after effective address calculation. memory accesses, which are inherently slow operations. A better method is to use the addi instruction with the constant set to 0. In any of the processors under study, memory-to-memory transfers are not supported. However, in other processors, these may be a possibility. 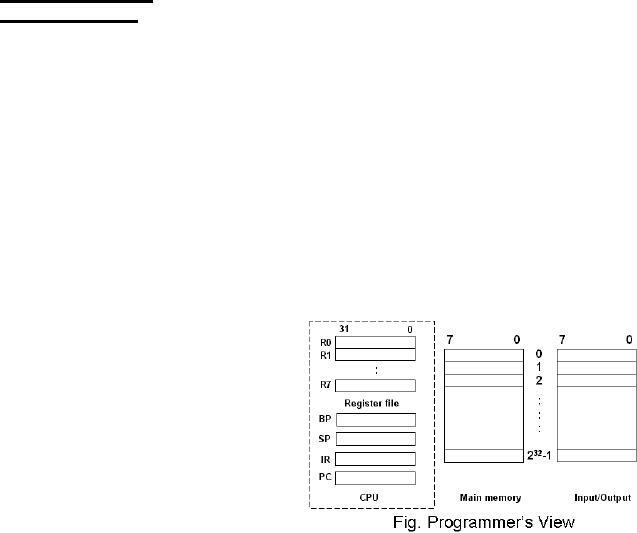 processors under our study use this mode of conditional branching. processors we are studying use this mode of conditional branching. be a constant, a register or a location in memory. given in this immediate field, e.g. 123 is an immediate value. register R4 may contain the value being referred to. to, for example, M [R3]. currently stored in the program counter. memory location to be referred to. that referred to in the instruction, e.g. -M [R4]. 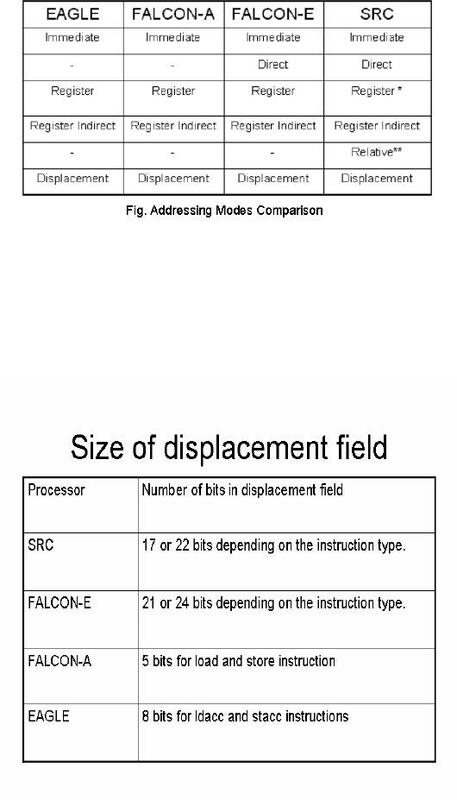 The given table lists the addressing modes supported by the processors we are studying. the shown table, relative implies PC-relative. addressing mode at length now. 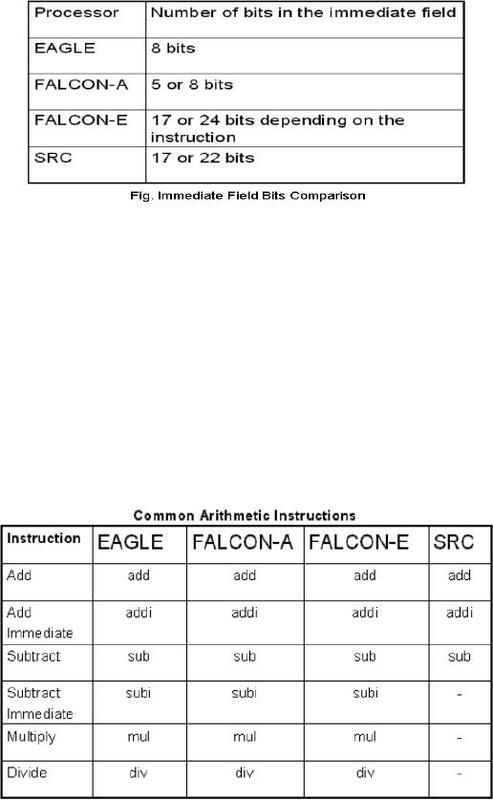 The given table lists the size of the immediate field in our processors. Architectures of all the processors under our study. and, andi, or, ori, not. Right shift, left shift & arithmetic right shift. 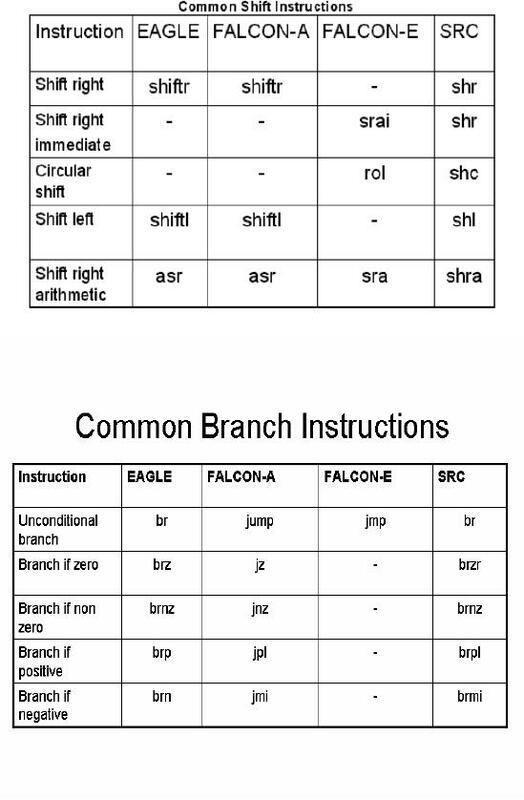 Conditional and unconditional branches, nop & reset. instructions for all the processors under comparison. This instruction is to tell the processor to `never branch' at that point in program. register given in the instruction, if the condition register's value is positive. Return address is saved before branching. register given in the instruction, if the condition register's value is negative. register given in the instruction, if the condition register's value equals zero. zero. Return address is saved before branching. The given table gives its implementation in all the four processors under comparison. this operation as compared with the rest of the processors.